Spare a thought for the poor editor who has the unfortunate task of stoically enduring my rather juvenile sense of humour. Back in 1998, I’d completed my undergraduate degree only the prior year, with honours, and on an entirely part time basis. That part time degree had been a long haul. However, ever since leaving home at a very young age I’d also been working full time, renovating houses on weekends and at nights, catching up with friends, and ensuring that the editor was a happy lady. Honestly, at that time, I was perhaps a bit too busy. Back in 1998, I felt like the Chris batteries needed a bit of a recharge. So one day, the editor and I quit our jobs, we chucked a tent, some sleeping gear and a few bags of clothes into a small hatchback and set off to see this huge country. It is always best not to put too much thought into those sorts of adventures because otherwise, you won’t do them! Of course the downside of not giving the whole adventure too much thought meant heading off during the middle of a cold winter to the obvious first destination which was: the island state of Tasmania. We were cool and the weather was also a bit cool! The capital of the island state of Tasmania is the city of Hobart at the southern end of the island. And the editor and I pitched our tent at a caravan park right on the shores of the River Derwent. Nobody else in their right minds pitched a tent on the shore of the River Derwent over the middle of winter. So we had a beautiful and private shoreline all to ourselves. The Chris and Editor batteries slowly recharged because we slept solidly in that tent for about twelve hours per night, every night for a couple of weeks. There was absolutely nobody around and the only sounds were the gentle sounds of the lapping waves against the shoreline. At night we headed out to eat at the beautiful wharf area in the city of Hobart which is full of charming old sandstone buildings containing cafes and restaurants. During the day, we travelled around and visited the tourist sites and the nearby National Parks where we walked around for hours and hours. It was a blissful time. Nowadays that glorious camping site is the location of the fascinating Museum Of New and old Art (MONA) where exhibitions such as the upcoming: Dark Mofo (whatever that means) attempts to outrage the young and old alike! As a charming side story, the art critic Michael Connor of the conservative literary and cultural magazine Quadrant reputedly said that “MONA is the art of the exhausted, of a decaying civilisation. Display lights and taste and stunning effects illuminate moral bankruptcy. What is highlighted melds perfectly with contemporary high fashion, design, architecture, cinema. It is expensive and tense decay.” How cool is that!!! As such, it is the number one tourist destination in the state of Tasmania. Regular readers will know by now that I am always banging on about manure. So too are the good folk at Mona who have a working: cloaca poop machine. That’s cool! Eventually, the editor and I (and the hatchback) boarded the ferry leaving the island state of Tasmania behind us as we returned to the dock in Melbourne. From Melbourne we roared (as fast as a little hatchback can do, anyway) out of the state of Victoria and headed west into South Australia, and eventually north up the only main road (the Stuart Highway) that cuts north-south (2,834 km or 1,761 miles) right through the middle of this continent. It is a very impressive bit of infrastructure and during WWII with the Japanese bombing the northern Australian city of Darwin, a 492 km (306-mile) section of that highway was built in under than 90 days. In one week, 18 km (11 miles) was constructed, which was claimed to be a world record. And all of it was constructed to withstand heavy military traffic. One of the towns in South Australia along that Stuart Highway is Cobber Pedy. The town is a hot and dry place, as is much of that part of South Australia. In fact there was so little going on in that part of the world that during the 1950’s the British used to test nuclear weapons at a site a few hundred kilometres to the west of it. Anyway, the town of Cobber Pedy exists because opals are mined there. The locals are quite clever because they live in beautiful underground houses. It is much cooler living underground in those climactic conditions, but there is also the chance of discovering opals during the excavations of the house! Back in the day, the locals told me that if you wanted to construct an underground house, you had the choice to either: pay for the excavations and keep the opals; or have someone perform the excavations at a minimal cost, but you had to sign over the rights to the opals discovered during the excavations to them. What a conundrum! The editor and I just had to stay in an underground house for the night, and so we did. It was quiet and very dark at night there! The US punk band that I borrowed the lyrics from for this week’s blog is the: Ben Folds Five. That US punk band had its debut hit in 1996 which was titled “Underground” and the very catchy chorus had words to the effect that: “Everything is heavy underground”. Anyway, because I have a juvenile sense of humour (spare another thought for the poor editor) I wrote in the guest book of that underground house in Cobber Pedy: Everything is heavy underground! Thus proving that I was never cool. 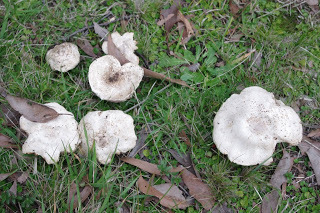 However, in a strange twist of fate, many years later in about 2004, the lead singer of that US punk band lived for a while in the Australian city of Adelaide which is the capital of South Australia which is not that far from the remote underground town. Perhaps my little joke was a premonition? Jokes aside, as a young adult, I wasn’t really cool. To start with, I got married to the equally uncool editor at a young-ish age and we moved to a small house in a gritty inner city industrial area where we spent much of our time repairing old houses. The gritty inner city industrial area was perhaps very unappealing, as not many people were that excited to visit us. Instead I headed off to the nicer and greener suburbs where most of my friends rented. My friends were cool. Sometimes, they’d swan into parties looking and acting very cool, as perhaps they were. The editor and I in comparison, were like the little ducklings at the edge of the pond but we were truly comfortable with that and just got on about our own lives and business. The funny thing is that after all of these years, some of my oldest friends are not so cool now! In comparison, the little ducklings that is the editor and I, just kept determinedly going about our own activities without regard for what is and what isn’t cool, and maybe that is cool? It has been another epic wet and cloudy week here. Seriously the off grid solar power system is only just – and sometimes not even – covering our usage. And there is still a month to go before the sun is low enough in the sky that power generation via the solar photo voltaic panels becomes a very serious problem. That is not a cool situation. The legal restrictions on land owners in this corner of the planet to be able to conduct burn offs have been lifted for the winter. 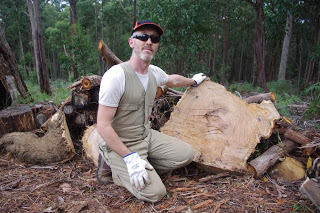 I have been taking advantage of this to clean up some of the surrounding forest which is full of detritus from the logging activities which went on here for about a century. Random tree stumps are one form of detritus which was thoughtfully left behind by the loggers. The reason they left the tree stumps behind is because being massively hard timber, the tree stumps are enormously hard to remove. 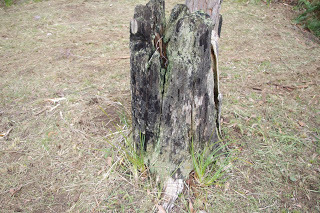 Nature has a huge amount of trouble breaking down the tree stumps into soil too and the next photo shows a typical tree stump showing charring from the most recent bushfire which swept through this property in January 1983. 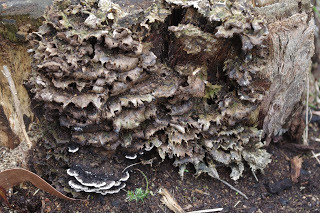 Even really tough and gnarly fungi makes only the merest of dents into timber of the remaining tree stumps. Clearing up the random tree stumps makes maintaining the property easier and improves the top soil and diversity of plant and animal life. 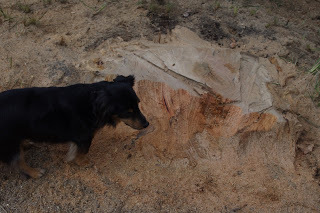 The process that I use to clear up the tree stumps also generates a lot of sawdust which is converted by the life in the soil within a year or two into rich top soil. The first step in removing an old tree stump is to cut the tree stump to just above ground level using my chainsaw. The amazing thing is that usually the cut sections look pristine and unaffected by time. I put those chunks aside where they are split later into firewood sized chunks for use in future years. The next stage involves using my stump grinding machine to grind the remaining timber into sawdust. 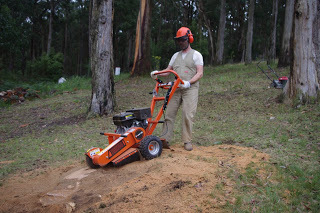 The stump grinding machine can only lower the tree stump so that it is below ground level. It can take anywhere between 20 minutes and 2 hours to completely grind a tree stump to below ground level. Observant readers will note that the stump grinding machine produces an enormous quantity of sawdust. A closer photo shows that the spinning head of the stump grinding machine rips into a tree stump. Eventually the tree stump is reduced so that it sits below ground level. Over the top of that tree stump, I add some of the sawdust, soiled chicken bedding, and coffee grounds (and Toothy). I expect that within a year, the soil in that location will be deep, rich, and full of life. The massive Eucalyptus Obliqua (messmate) trees which surround the orchards are the second tallest flowering trees on the planet. 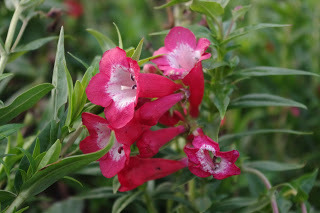 They are also extremely hardy and out-compete most other plants by exuding germination and growth inhibitors from their leaves and root systems. 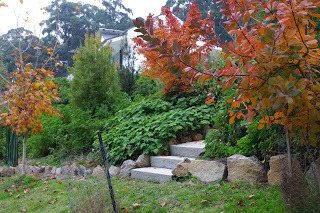 Even the old tree stumps inhibit surrounding plant growth. The fancy word for that process is: Allelopathy. 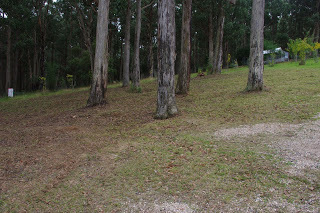 I have been slowly building the top soil underneath these tall eucalyptus trees by a process of chopping and dropping the vegetation underneath the tall eucalyptus trees using my little push mower. 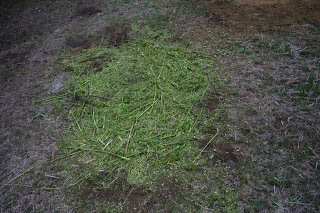 This process of chopping and dropping the vegetation mimics the regular burn offs that the Aboriginals used to perform in the forest – without all of the smoke and ash and stuff! 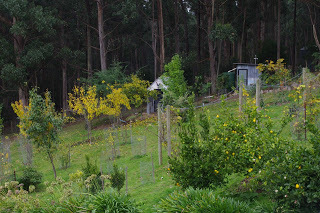 Very observant readers will note in the photo above that there is a very solid demarcation line between the orchard and the drip line of the tall eucalyptus trees. 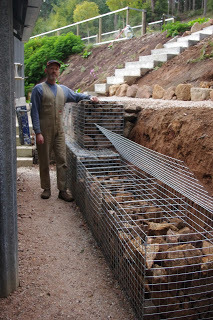 I have also been beginning preparations for a huge rock wall for the planting of a walnut tree or two. 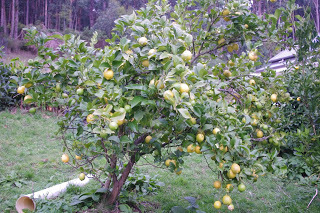 Walnut trees are another tree that does not play well with others and so these trees will be well away from the orchard. 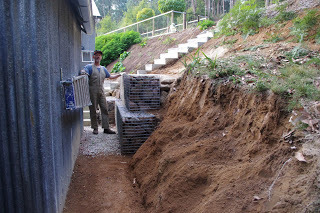 The huge rock wall will make use of some massive rocks that I have previously wondered what to do with. And all of them will be moved by hand using steel house wrecking bars as levers. 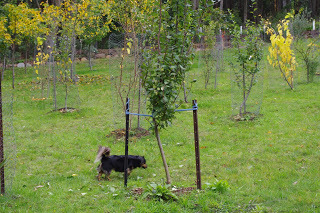 One of the wallabies has learned a new trick which involves pulling young apple trees over so as to gain access to the leaves. I have had to brace this particular young apple tree using steel stakes. Oh, just quickly, the other morning I impressed even myself at the sheer quantity of cooking that was going on in the kitchen that morning. 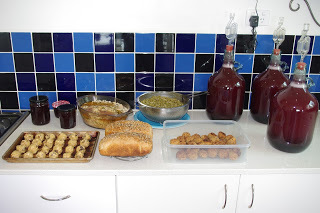 The cooking included: Blackberry jam; Blackberry wine; Toasted muesli; Shola-e Ghorbandi; Anzac biscuits; Two loaves of bread; and Dog Biscuits. Cooking from scratch is not only a cool activity, it will save you heaps of mad cash! The temperature outside now at about 8.30pm is 10’C (50’F). So far this year there has been 330.8mm (13.0 inches) which is more than last week’s total of 277.4mm (10.9 inches). With the greatest respect for Ben Folds and the Ben Folds Five for their excellent contribution to the sphere of music! The 1999 album Unauthorized Biography of Reinhold Messner is total genius. The computer room at the University during the 1970’s was an amazing place. I visited the computer room with my mum one weekend afternoon. I can still vividly recall the image of that room in my mind. My mother was there because she was studying an undergraduate degree and I was perhaps a bit too young to be left unattended. The computer room was full of keyboards and black screens with their little green characters. And then there were the huge platters of gold coloured discs which were occasional being dropped into something that looked like to me like a top loading washing machine. The room stunk of industriousness and ultra high tech gear and I felt as if I was in the engineering room of the Starship Enterprise. It was quite amazing that my mother was even able to attend University because she was a single mother with three children and she also had to work full time. Back then University courses were free of charge. Of course being free of charge does not make them free of work and my mother would have been a rather busy lady. One of the advantages of my mum being so busy was that I was left to think my own thoughts and become my own person. However, a downside to living with a single mum who worked full time and studied part time, was that there was never much money floating around for us kids. This wasn’t too much of a problem for me because I was a self confessed little capitalist who sometimes worked up to three jobs just so that I had enough mad cash to burn on important kid investments such as Space Invaders and pin ball games. I even distinctly recall that one point in time, my mother had to borrow money from me for some reason or other. I was of course happy to offer an unsecured loan at interest with fixed terms to accommodate this need. The mercenary relationship was a two way street, because when I scored my first full time job as an adult, my mother levied me a regular charge for board which was over half of my take home pay. To be honest, it was financially cheaper moving out of home and in with friends into a share house of five people. I soon found myself working full time with aspirations of achieving a University degree. This meant that I had to study part time at night whilst working full time. I’d seen firsthand that such an eventuality was a feasible option, and so I just got on with the job at hand. The very first year of my part time experience at University also miraculously coincided with the re-introduction of course fees for students. I discovered to my horror that I was rapidly accruing a student debt with every single class that I attended. In Australia student debt is held by the Federal government and repaid through the tax system depending on a persons taxable income. If your income falls below a certain threshold, you don’t have to make any repayments. However, this week the Federal government announced that it would seek to increase University fees by 8%, whilst at the same time reducing the income threshold for repayments for people with student debt from about $54,000 to I believe about $42,000. Many people who have not attended or have no intentions of ever attending University make the correct claim: Why should they subsidise University courses with their taxes? I am comfortable with this claim. However, that claim also assumes that there is an underlying fairness and equality to government policy, and I am aware that many people who received free University education in the now distant past pay no taxes on their pension income. And I am uncomfortable with such inequalities in policy which are breeding wealth inequality in the community. I for one don’t believe the kids are alright. Today, for some strange reason I was considering the issue of wealth inequality and I recalled a story from my past which highlighted how I felt about the issue of wealth inequality as a very young man. My girlfriends parents at that time were refreshingly candid about my future prospects in that they didn’t believe I would amount to much. As such it was clear that they felt that their daughter and I were an unsuitable match. I politely ignored them, acted in a surly manner, and simply went about my business. My girlfriend was lucky enough to have been presented with a brand new vehicle by her parents. As a contrast, I had a little very old and very used white Suzuki Sierra four speed vehicle. That Suzuki Sierra was barely reliable and I was forever maintaining it or replacing failing parts. My girlfriends parents also owned a holiday house on the coast. One weekend the girlfriend invited me to spend the weekend with her at the holiday house which would have been fun. However, that time was also the recession of the very early 1990’s and even though in my youth I was a budding capitalist, I had barely enough income to match my fixed outgoings. And that meant that I did not have the $40 petrol (gas) money to make it down the coast and then back again. You see, my girlfriend had thoughtlessly just driven down in advance in her paid-for vehicle and just assumed that I would follow down later in my little white Suzuki Sierra. Not so! The phone conversation that ensued was less than pleasant as I pointed out these gritty realities in a less than gentlemanly tone. That evening, instead of travelling down the coast, I ended up visiting some friends who lived only 15 minutes away. Needless to say the girlfriend and I broke up not too long after that incident. Angry on one side of that equation and thoughtless and indifferent on the other, and that to me is how the gritty realities of wealth inequality play out. As an interesting side story: The editor on the other hand owned a large and old poo-brown Chrysler Valiant Safari station wagon that was unable to be driven in reverse. In that poo brown station wagon was often to be found a rather fat brown dog who jumped around the insides barking for the sheer joy of the experience in between chewing the seats. I knew I’d found the right girl (and dog) for me. It has been another wet and cold week here at the farm. 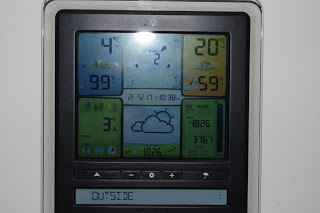 One evening I noticed that the outside temperature had dropped to as low as 3’C (37’F). Even Poopy the Pomeranian (who as everyone now knows is a sophisticated Swedish Lapphund) was feeling a little bit chilly even though he has a double layered dog coat. At least the new wood heater is keeping the inside of the house toasty warm. Best of all, the new wood heater – which through diligent research I now know is described by the fancy name of “wood boiler” – uses far less firewood than the previous wood heater despite heating a bigger space. Heating a home with firewood is a very complex matter and even after seven years of living with this energy source, we are still learning. During the installation of the new wood heater we moved one of the hydronic radiators. The repairs to that wall where the radiator used to be are now almost complete. 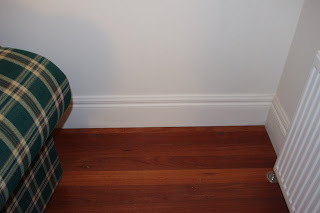 In another week, nobody will ever know that there even was a hydronic radiator in that location. 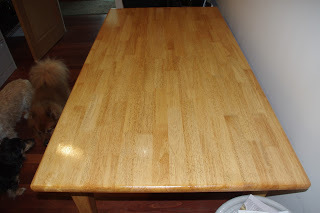 A coat of Tung Oil was applied to the table which was sanded this week. Five more coats of Tung Oil to go! 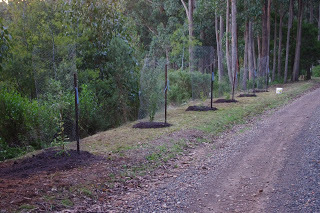 Along the road above the house, we planted a series of bottlebrush native plants. 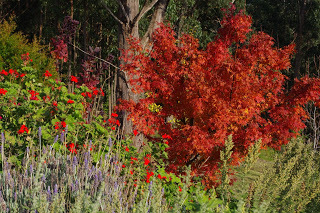 The fancy name for these trees are: Callistemon and Banksia species. 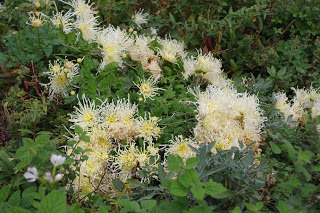 They are called bottlebrush plants because the flowers look exactly like bottlebrushes, and I must add that the local honeyeater birds adore the flowers for their nectar. 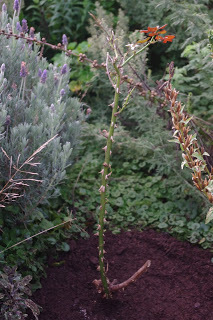 I almost lost a beautiful apricot coloured rose which was unfortunately planted in a dense herb bed. 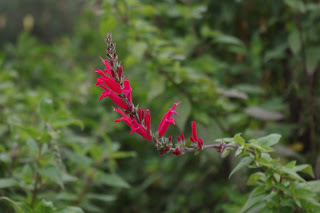 The growth in that herb bed was so thick and rampant that I could no longer see the rose. This week, I took a very sharp brush hook to the rampant growth in that herb bed and rescued the little apricot coloured rose. Once I discovered where the rose actually was, I relocated the rose to a spot where it would be unlikely to be out-competed by the other plants. Earlier in the week I had brought a huge load of mushroom compost onto the farm. 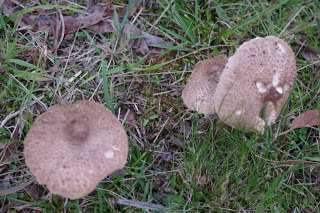 Unfortunately I’d purchased far more mushroom compost (the curse of Cherokee!) 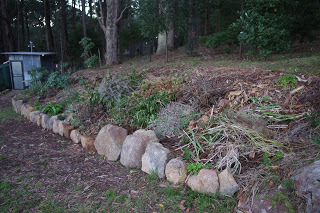 than I could reasonably handle and so the extra mushroom compost was used to top up some of the newer garden beds. 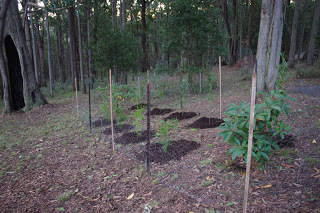 Another grove of blackwoods (Acacia Melanoxylon) and sticky wattles (Acacia Howitti) was also planted out this week near to the very ancient canoe tree. 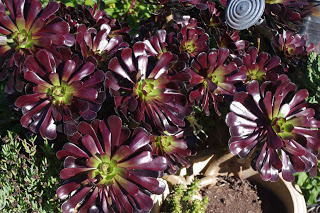 Nowadays I spend more time cutting back rampant plant growth than planting new plants. 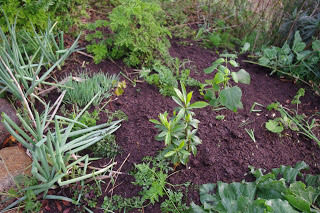 None of that cut organic matter goes to waste because I dump it in a new garden bed which is near the chicken enclosure. Over time, that organic matter will break down into very rich soil. One of the strangest things that I have seen in urban areas was people hauling organic matter or cut grass off to the local landfill. I use the fancy word “strange” to describe that activity because they are actively sending their soil fertility to a landfill! 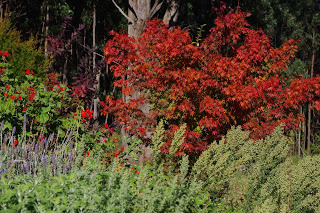 The leaf change is continuing to put on a good show here (and in the valley below) and Japanese maples are one of my favourite plants. It is also a pleasure to not have to deal with the pesky tourists! The temperature outside now at about 9.00pm is 8’C (46’F). So far this year there has been 339.0mm (13.3 inches) which is more than last week’s total of 330.8mm (13.0 inches). A special shout out to the exceptionally talented local artist Gotye for his song “Eyes wide open” which was ripped blindly in this weeks blog. Some may know him for his famous song “Somebody that I used to know”. His back catalogue of works are outstanding. It is a truth universally acknowledged that dragons accumulate gold. A dragon is a mythical fire-breathing monster which is sort of like a giant flying reptile. Why a dragon would want to accumulate gold is a motivation that is beyond my understanding. However, dragons are mythical creatures after all and as such they don’t have to worry about the nitty gritty little details of life such as eating, finding shelter and paying taxes. The author J.R.R. Tolkien wrote a story of high adventure about a lone Hobbit (a mythical creature) who joined a band of dwarves (another type of mythical creature) who set out on a quest to plunder the accumulated gold which was being hoarded by a dragon who had the unlikely name: Smaug. The dwarves were motivated to set out on this adventure by a desire to reclaim lost property. You see, Smaug the dragon had allegedly misappropriated the dwarves stash of mad cash (gold). Of course we have to remember that Smaug was a dragon, and as such he could fly around causing mayhem whilst breathing fire, which brought unpleasant circumstances for those unprepared for such an eventuality. The friends and relatives of the dwarves had suffered this fate at the claws and fire breathing mouth of the dragon. The hobbit was a more complex character because he hadn’t actually lost any gold to the dragon. In fact neither he nor his friends and relatives had even encountered a dragon before. As such his motivations for joining the band were a bit obscure. Perhaps the hobbit in question was bored or he was at a loose end one day and the opportunity for adventure arose, who knows? Whatever the case may be, the merry band of dwarves and one hobbit headed off into the wilds and through many adventures and by dint of good luck, the band eventually arrive at the Lonely mountain and confront the dragon. Smaug was in no mood to hand over the gold. To cut a long story short, Smaug the dragon became annoyed at the audacious dwarves. Smaug then flew out to destroy a nearby human settlement (as you do), where after much mayhem and destruction Smaug was killed by a champion bowman. Shortly thereafter, every nearby community realised that the hoarded gold was no longer defended by the dragon and so they all sent any person, who could bear arms, off to get some loot. The forest elves were one of the nearby communities lured by the prospect of all that unprotected gold. Of course the forest elves also helped the human settlement that was almost wiped out by the annoyed dragon (note to self: don’t annoy dragons) and that was a noble act. A separate army of dwarves headed out of the nearby Iron hills to help the small band of dwarves and hobbit adventurers who faced the awful prospect of facing a large forest elf/human army who wanted a share of the gold. The whole situation was a sticky mess and needless to say there was an inevitable clash where the surrounding land was again laid waste. The victors distributed the gold as they saw fit. Perhaps the meek don’t inherit the gold. The funny thing is that prior to Smaug’s demise, the forest elves, humans and dwarves all got along just fine. Alert readers with a keen understanding of economics may realise that the sudden increase in the gold supply in those surrounding communities would have an inflationary effect. Gold would clearly not have been worth what it used to be! To me it all seemed like a lot of hard work and serious discomfit, all for a bit of gold. Our society is much smarter than Tolkien’s fictional world because instead of using gold as a medium of exchange, we use money. And people are always concerned for my welfare in that regard because they occasionally offer helpful hints as to how I can obtain more money. It is very nice of the people to provide those helpful hints which have included: “you should offer accommodation”; “you should sell some of the produce at the local farmers market”; “you should run tours”; and “you should sub-divide your land”. Those suggested activities will indeed provide me with more money. However, if I were to spend my time pursuing those suggested activities I would have less time with which to pursue the projects that we do undertake at the farm, and which I take great pleasure in. The quiet enjoyment of the farm would also be lost. It is at these times that I recall the words that were attributed to Alanis Obomsawin who wisely said: “When the last tree is cut, the last fish is caught, and the last river is polluted; when to breathe the air is sickening, you will realize, too late, that wealth is not in bank accounts and that you can’t eat money.” I wonder if the dwarves holed up with Smaug’s accumulated gold after the demise of the dragon realised their dilemma. 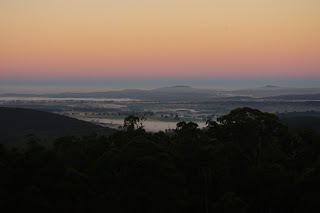 Smoke haze from large scale burn offs produced the most spectacular sun rise this week. The peaks of Mount Bullengarook which is in the middle of the above photo and Mount Blackwood which is to the right are just sticking their heads above the smoke haze. The clouds which settled in the lower parts of the valley are patches of very cold and very moist air which accumulated in all of the low lying spots. 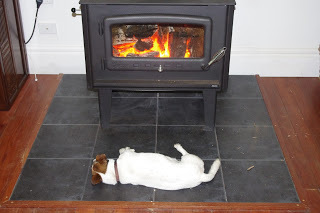 Given the cold nights, it is a pleasure that the new wood heater is continuing to work well. We have almost completed the many repairs associated with that project. 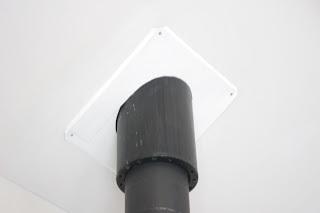 A cowl (a fancy word for a metal cover plate used with chimneys) now covers the rough plaster work where the wood heaters flue enters the roof space. 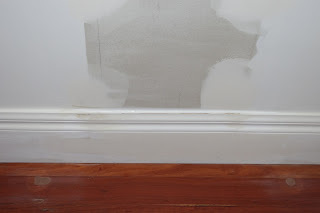 The repairs are now complete to the wall where a hydronic radiator was previously located. It may be cold outside, but it is toasty warm in the house. Anyway, cold weather has some undocumented benefits. 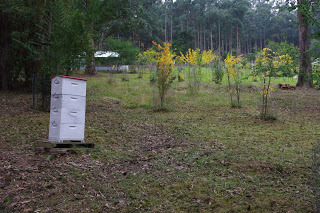 Now that the days are colder, I am able to mow around that part of the orchard which is very close to the bee hive. 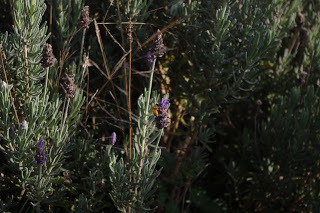 Even still, the bees ventured from their toasty hive to check out what I was up to. 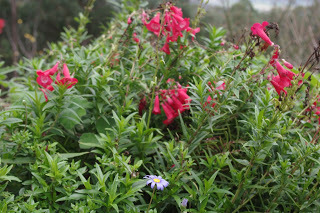 Fortunately, I was not stung by the bees, and the mowing was able to be completed. Speaking of bees, the agapanthus flowers make great drought hardy nectar and pollen supplies for the bees. 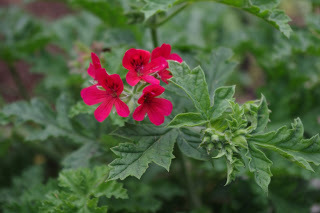 And I have huge numbers of these plants which the bees are very happy about. However, at this time of year the long stalks which the flowers sit atop tend to fall over and become a serious trip hazard! 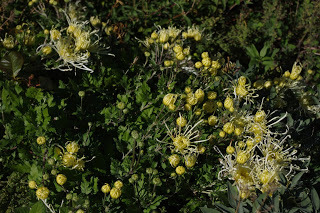 As you can see in the above photo, the plants produce a lot of flower stalks. 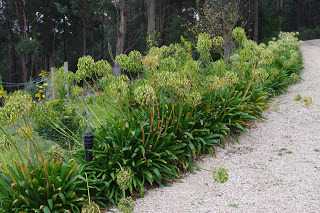 Using an electric hedge trimmer, we cut hundreds of flower stalks from all of the agapanthus plants. We then collected all of the flower stalks into many wheelbarrow loads. The wheelbarrow loads were then dumped into two slight depressions in the paddock. I then ran over the entire mass of flowering stalks with the mower. Chopping up the flower stalks has the effect of increasing the surface area of all of that organic matter. That should give the life in the soil a jolly good feed. 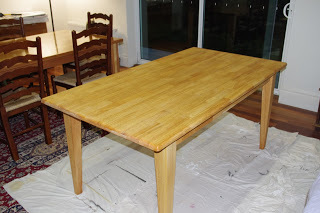 Last week we began repairing one of the tables which we’d originally coated with a surface treatment that basically made the table look orange. To be honest, the table looked a bit weird. So, last week that table was sanded back to raw timber, and the table has now had five coats of Tung Oil applied to the surface. I am typing this week’s blog on this desk and I reckon it now looks pretty good. 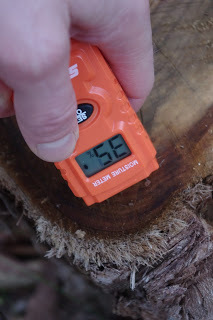 Over the past few weeks I have been attempting to learn more about firewood and the science of heating with firewood. It is a complex matter and one which I have not yet mastered despite many long years of experience. Fortunately I received a recommendation from a commenter (kudos to Claire!) for a book on the subject written by Dirk Thomas who has had many longer years of experience as a chimney sweep. A chimney sweep is a person who is paid to maintain wood heating devices. The book is titled: “The Woodburner’s Companion: Practical ways of heating with wood”. Interestingly, most of my stored firewood was in the 15% to 16% range which makes for some very good quality firewood. 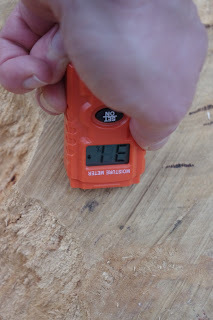 The occasional piece of stored firewood measured 23%, and what was notable about those particular chunks of firewood was that the firewood displayed signs of previous termite damage. Clearly termite manure and the tunnels that the insects make, hold a lot of water. 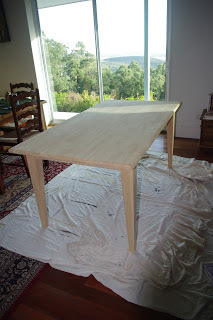 The driest item of timber was the dining table which scored 11% (kiln dried timber). 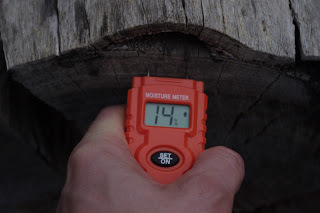 Even the very old timber in the clothes washing horse which constantly sits in front of the wood fire scored 12%. The core message which I now understand about firewood, is that if you want to use it as a heat source you have to have appropriate systems in place at every single step in the process, from tree to heat. Near enough is not good enough. The wild birds here are forever mucking around and getting up to mischief. 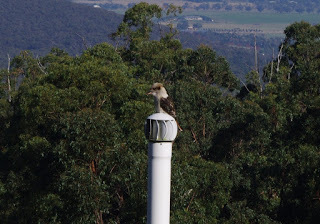 The other morning I spotted a Kookaburra sitting on the whirly gig which sticks up out of the worm farm sewage system. The Kookaburra was enjoying being spun around and around as the whirly gig caught the occasional breeze. A neighbour with an old Medlar tree donated a huge batch of Medlar’s to us which we are slowly bletting (that is a fancy name for rotting / or more correctly fermenting) on every available flat surface of Fernglade Farm. 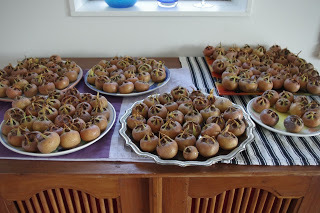 Once the fruit has bletted, we will make a batch of tasty Medlar wine and another batch of Medlar jam. Yum! 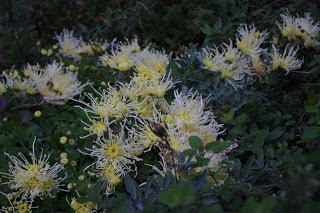 Who doesn’t love the very weird chrysanthemum flowers? Such a delight. The temperature outside now at about 8.30pm is 9’C (48’F). So far this year there has been 344.0mm (13.5 inches) which is more than last week’s total of 339.0mm (13.3 inches). Alfred’s catchphrase line is: “What, me worry?” And in uncertain times such as these, such a personal philosophy as espoused by Mr Neuman, is I reckon quite useful. There have been times in my life when I have been in sore need of plain old good advice. And sometimes that good advice is not to be found anywhere. In those circumstances, not worrying and simply getting on with the job at hand and/or squaring up to the problem seems to work well for me. 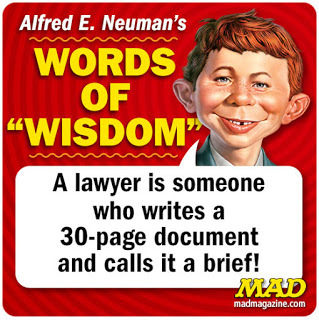 I reckon that Alfred E Neuman is onto something. I don’t really know why good advice is hard for us to find, but I have rather suspected for a long time now that good advice is hard for us to obtain because the editor and I are not following the dominant narrative. The dominant narrative is a collection of stories which people tell themselves which seeks to define the majority cultural practices of a society. Incidentally, those stories may be true or otherwise. The editor and I are hardly that far from the dominant narrative, yet we are far enough from it because we confuse the stuffing out of other people. The confusion in other people about our lives most often expresses itself in the form of an interview which is conducted by other people. And the questions posed in that interview are remarkably similar regardless of the person asking them. In fact it is a fair thing to say that the questions that are asked of me regularly are identical. This identical questioning by different people cannot be a coincidence. I have already covered one of these questions in a previous blog essay (It costs a lot to live this cheap). That question is always asked: “So, how many days per week do you work?” I always answer that question honestly and then slowly guide the conversation around to how my situation is possible. If the person asking that question takes the time to understand how I achieved this income situation, they may be able to apply the lessons told to their own life and that is generally an excellent outcome for them. However, this week I wanted to discuss another question that is regularly asked of me (but interestingly never to the editor). 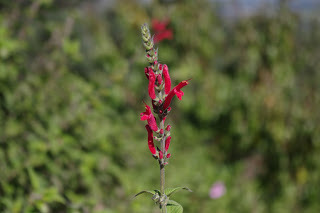 That question is: What will you do when you can no longer perform the physical work which is required around the farm? For a start it is worth noting that underlying this question is a much deeper assumption which more or less says that the dominant narrative provides a useful role for people who are no longer able or prepared to perform work (i.e. retirement and going on cruises), which may not be available to me here at the farm (maybe because of the lack of boats nearby). And their expectation is that this situation will continue into the far distant future. I’d like to address that issue because it is important. Recently, down here in the land of Oz, the retirement age for persons of my generation and younger was lifted to the age of 70. I feel that the unstated objective of that policy is that I may be unable to receive a pension before that retirement age. Therefore I will have to work until the age of 70, whether I am physically able to or not. Using Alfred E Neuman’s philosophy of not overly worrying, I have long since accepted this fate. On the other hand, as time progresses, the knowledge of producing foodstuffs appears to me to be dwindling in the general population (following the dominant narrative). I also feel that the foodstuffs that are generally offered to the general populace is declining in quality. So in answer to the question posed to me, my obscure and mysterious answer is: that I will be useful as long as I am useful. After that point, all bets are off! Until then, I will take a leaf out of Alfred E Neuman’s book and ‘why worry’? 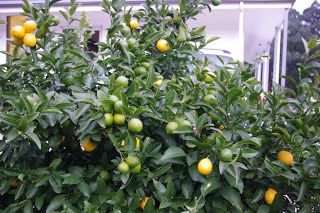 Autumn is a time of harvesting and preserving the summer produce. It is a very busy time for us as long term readers of the blog will note, this year has been no exception. Winter on the other hand is a time of building or repairing infrastructure. This week, we have been working on the infrastructure. 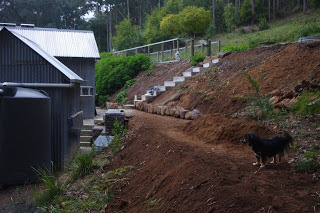 A day of excavations reshaped the garden bed which falls down to that upper walkway above the rock gabion wall. 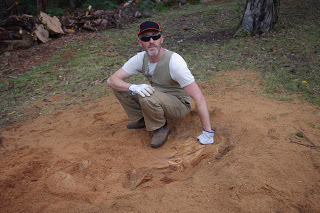 We didn’t excavate too far in one day because we uncovered a huge old tree stump. We’re becoming quite adept at removing tree stumps and in this instance we used a combination of the chainsaw and wedges to break apart the old tree stump. That job of removing the tree stump from the future walkway took several hours. After a couple of hours of further excavations, a whole lot of clay was removed from the excavation site. 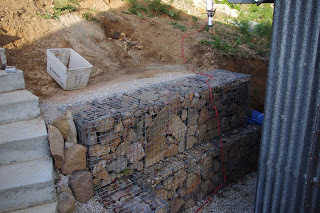 A new rock gabion cage was constructed. 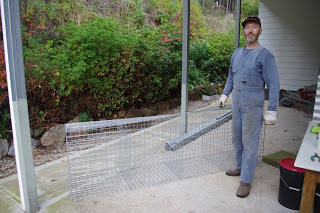 For those who are curious, these rock gabion cages take us about two and a half hours to construct from three flat welded mesh sheets. Then further excavations took place. 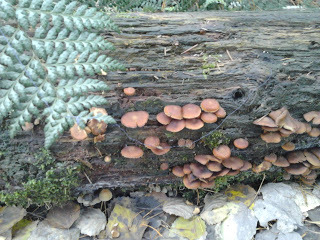 This time I didn’t find any old tree stumps. Instead I found a huge floating rock. Geologists and engineers call these rocks by the technical name of “Floater” because they float in the clay. 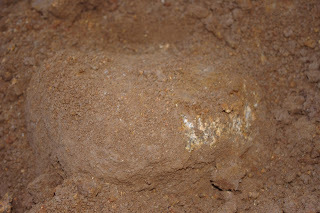 It took me a while to remove this floater and I used a combination of the electric jack hammer (solar powered, of course) and hand tools to remove it from the clay. Alert readers will already understand that the floater will make an excellent addition to a rock wall! 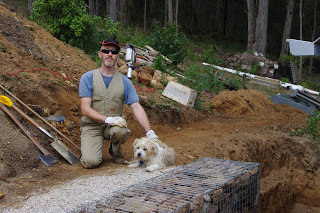 Eventually, the excavations were completed and I was exhausted, however I was able to place the new rock gabion cage in place. 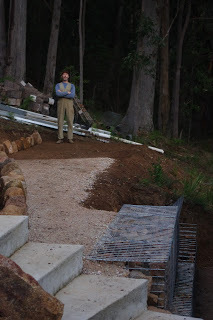 That rock gabion cage is now only waiting to be filled with rocks. 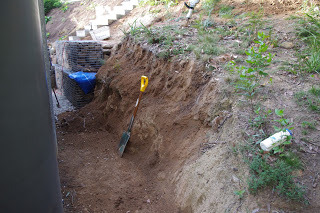 It is fortunate that during all of those excavations that I unearthed a plethora of rocks. 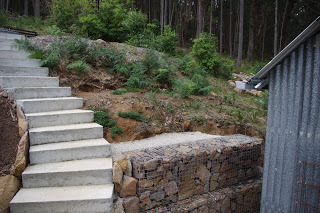 Fans of symmetry and order will note in the photo above that the rock gabion cage aligns perfectly with the existing rock gabion wall! This is one of the benefits of performing excavations slowly by hand. A huge storm rolled over the mountain range this week. The large Bogong moths took refuge under the house verandas during the heavy rain, and so too did the stick insects. 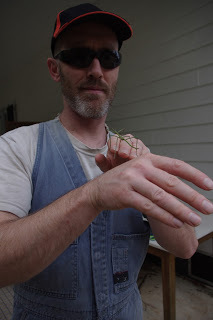 There are both huge brown and green stick insects and the other day I rescued this large green stick insect from the loving ministrations of the fluffy canine collective. 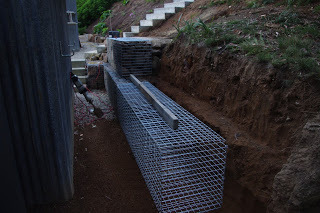 One of the reasons for all of the excavation works is that we intend to move the raised potato beds to that new flat terrace above the rock gabion walls. 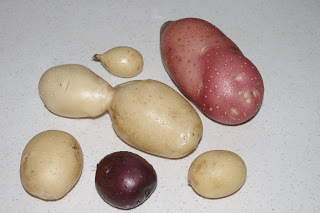 The potatoes in the raised garden beds have been a phenomenal success and over the past few weeks we have been harvesting tasty potato tubers as often as we need them. 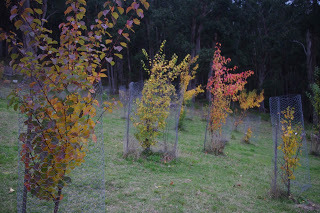 The autumn leaf change for the deciduous trees is almost done. 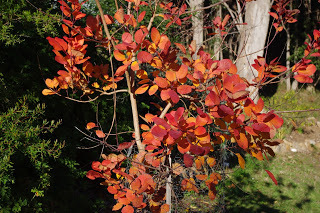 This week the smoke bush put on a beautiful display of colour. 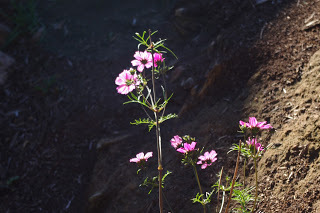 As I was excavating soil this afternoon I couldn’t but help notice that the autumn sun caught this lone cosmos plant and the flowers were almost glowing with energy! The temperature outside now at about 9.30pm is 11’C (52’F). So far this year there has been 360.2mm (14.2 inches) which is more than last week’s total of 344.0mm (13.5 inches). My football career ended at an early age during the very early 1980’s. Of course, by football, I mean the game of Australian Rules Football which is played in many corners of this continent. The game may be unfamiliar to many readers overseas, but I wouldn’t worry about that too much as my career ended at an early age and so the finer details of the game are unimportant to the story. I used to play for the Ormond (a suburb of Melbourne) Blues under 13 (years of age) football team. I was one of the smaller children on the football team and the coach was able to amaze me by propelling the football by hand further than I could kick it. It was not an auspicious start to my football career. That football team was a bit down on its luck that year too, because they had failed to win a single game. If memory serves me correctly, the team had only won a single game the previous year too (please note that I did not avail the team of my services on that particular winning game!) against the nearby rival team: the Ormond Amateur’s under 13’s. Alert readers may wonder whether there was something in the water in that particular suburb causing the general lack of football success against other suburbs in the district? The game of Australian Rules Football is played during the winter season, and as such I always ensured that I got covered with at least a bit of mud just to show that I was a team player. And being winter, I have fond memories of purchasing many a lukewarm meat pie after the game. The under 13’s always played their game first, well before the older teams, and so the meat pie warmer really never had a good opportunity to heat the meat pies to a proper temperature. Anyway, a lukewarm pie was probably a good challenge for my immune system and the pies seemed to do me no permanent harm. Anyway a good dump of tomato sauce covered all manner of lukewarm pie sins! In the year that I played for the Ormond Blues I clearly recall the day that they met their bitter rivals, the Ormond Amateurs. The Blues had to play the game at the Amateurs home ground, and so the opposing team had the home side advantage. And this was probably the only game of the year where my team would have even the remotest chance of winning, thus breaking their losing streak for the year. And so there was much excitement at that possibility of winning that game. Emotions were running high that day (if not pie temperatures)! In Australian Rules Football, the goals for either team are at either end of the field (like most other football styled games). And from hindsight I can see that the basic strategy employed by my team on that fateful game, was simply to stop the other team from scoring a goal – at any cost. What that meant in practical terms was that my entire team (other than myself) was at one end of the sporting field trying to stop the other team from scoring. And all of the opposing team’s players other than one annoying kid who stuck to me like glue for the entire game, were at their end of the field, trying to score a goal. In terms of general strategy, it was not what I would describe as a recipe for success. That quiet half of the sporting field was a pretty lonely place to be that day. The other kid was a complete nuisance because he wouldn’t even keep me entertained talking about anything remotely interesting at all, let alone expressing opinions about lukewarm meat pies or mud or even tomato sauce. Very unfair! The football game continued and it was complete mayhem at the opposition team’s goals. Epic battles were clearly being fought. Way down at my team’s goals, it was pretty relaxed really, and I didn’t even have the opportunity to get any legitimate mud on my woollen football jumper. Then in a moment of true weirdness, the football launched out of the mayhem at the other end of the the sporting field and sailed through the air in a mighty arc towards myself and the other annoying kid. Such events were unheard of, and I was clearly unprepared for such an eventuality. So, the annoying kid tried to catch the football whilst I did my very best to knock him to the ground unconscious, whilst at the same time making it look like an accident, or better still part of the rules of the game. This was not an easy task, and unfortunately, I did not succeed in knocking the annoying kid to the ground and the even worse, the kid reached for the ball before it hit the ground – and he completely missed the catch. That forlorn football bounced away from both of us. That football also had the good fortune of bouncing towards my teams goal posts which weren’t too far away from either of us. I saw my moment for true football glory and I ran at that football at full speed with the intention of grabbing the football and scoring a goal for the team. As I grabbed the football and ran at the goals, I heard the background noise which I had been trying hard to ignore: The noise was the umpires whistle. The umpire had declared that the annoying kid had actually performed a proper catch (the technical term for this catch is a mark) despite him dropping the football. I had to promptly return the football to the annoying kid rather knocking him to the ground unconscious, or scoring a goal for my team. So it was on that fateful day, the Ormond Blues lost the game to their arch rivals, the Ormond Amateurs. And I didn’t have any mud on me that day to display for all the world to see the passions that were spent by me on that sporting field. I played out the rest of the season with the team but failed to return to the team the following year despite still being under 13 years of age. The lesson learned that day for me was that sometimes you have to acknowledge that you are no good at something. However, this can then free you up to do something else with the time that you have not doing the thing that you are bad at. I did discover on that fateful day that as I ran at full speed towards the goal posts with the football that shall never be mine, that I was actually very good at running, and so after that I took up running as a sport. To be continued. 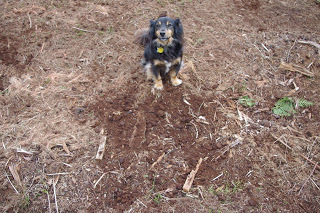 The other thing that I must be good at is digging! Living on the side of an extinct volcano, you have to know how to dig because, well, to have any flat land at all, means digging into the side of the hill in order to create terraces of flat land. This week we have been creating a new terrace for three raised potato beds (previously placed elsewhere but which need a new home). 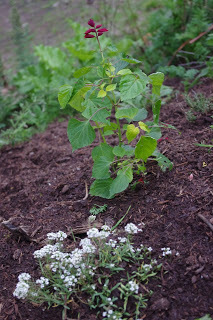 Home grown potatoes are so tasty, and the plants are so prolific, that they deserve their own growing space, which will be the new potato terrace. A day of digging clay produced a little bit more flat land. All of the digging here is achieved with the use of an electric (solar powered) jack hammer to break up the clay and rocks. Then hand tools are used to move the clay. Another day of digging extended the potato terrace. 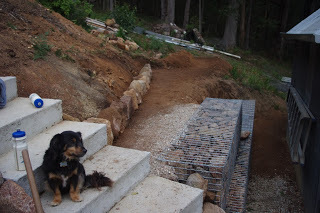 This time it was Toothy who looked on with approval at more flat land for the future potato terrace. Observant readers will note that in the photo above, the three steel round raised potato beds are just able to be noticed in the terrace above the current excavations. By the end of that day, even Toothy was looking a little bit freaked out by all of the hard work! Another day of excavations extended the new potato terrace even further. 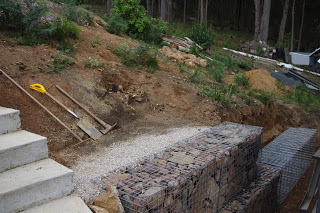 We managed to place a half cubic metre of the local crushed rock with lime so as to provide an all-weather surface to walk upon on the new terrace as well as against the rapidly filling new rock gabion just below the new terrace. As we dug into the side of the hill, we unearthed a rich vein of floating rocks. Long time readers will recall that the farm has long since passed Peak Rocks. Peak rocks is the point in time where all of the easy to obtain rocks have long since been utilised in various projects about the farm. 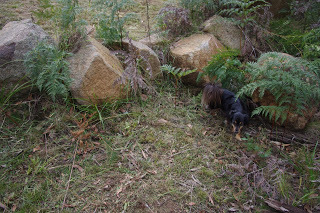 Striking a rich vein of rocks was like striking gold or oil for us! 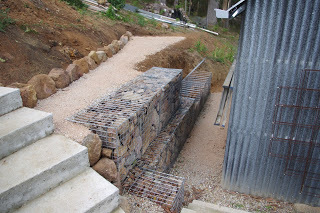 The new rock gabion wall was almost one third filled at that point in time. A final day of digging finished the excavations for the new potato terrace. Observant readers will note in the above photo just how large some of the trees are that surround this farm. 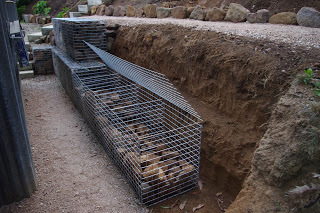 However, the most amazing thing about the excavations for the new potato terrace is that the new rock gabion cage is now almost two thirds full of rocks that were liberated from the digging! 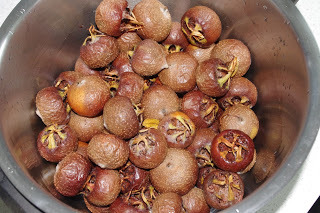 Some of the medlars had finished the bletting (the fancy name for rotting / fermenting) and we boiled them up in a large pot. The juice from the boiled fruit was then drained and frozen. When all of the medlars have fully bletted and processed, we intend to use the juice to produce medlar jelly and medlar wine – both of which are very tasty! The temperature outside now at about 9.30pm is 6’C (43’F). So far this year there has been 373.4mm (14.7 inches) which is more than last week’s total of 360.2mm (14.2 inches).